As part of the opening night of the Armadillo Christmas Bazaar Dec. 13, 2018 I signed my books in front of the Wild About Music booth at the Palmer Events Center in Austin. Broken Spoke owner James White accompanied me and later sang a few songs on stage with country and western star Dale Watson. As part of “Local Authors Day” at Barnes & Noble Sunset Valley, Broken Spoke owner James White together with singer Ben Stafford Rodgers, accompanied me to my book signing Dec. 1, 2019. We loved seeing old friends and meeting new ones while selling and signing my 2017 book, The Broken Spoke: Austin’s Legendary Honky-Tonk. James White and I signed books from 11 a.m. until 1 p.m. Oct. 23, 2018 at the South Austin Costco while dozens of Broken Spoke fans stopped by to chat. That day Austin Utility Company had announced a “boil water” order due to serious flooding, so consequently the number of shoppers at Costco increased ten-fold. Broken Spoke fan and my friend Shelley Sproull came out with her whole family to hear me talk and Christine Brown at Texas A&M University Press sold books. Singer and guitarist Ben Stafford Rodgers performed a few classic country songs and Deb Fleming moderated my talk. James White and I talked about the Broken Spoke and Ben Stafford Rodgers sang some classic country songs for a full house inside the Thompson Center at the University of Texas Oct. 5, 2018. Afterwards we sold and signed copies of my book for fans for the second time this year for the OLLI group. 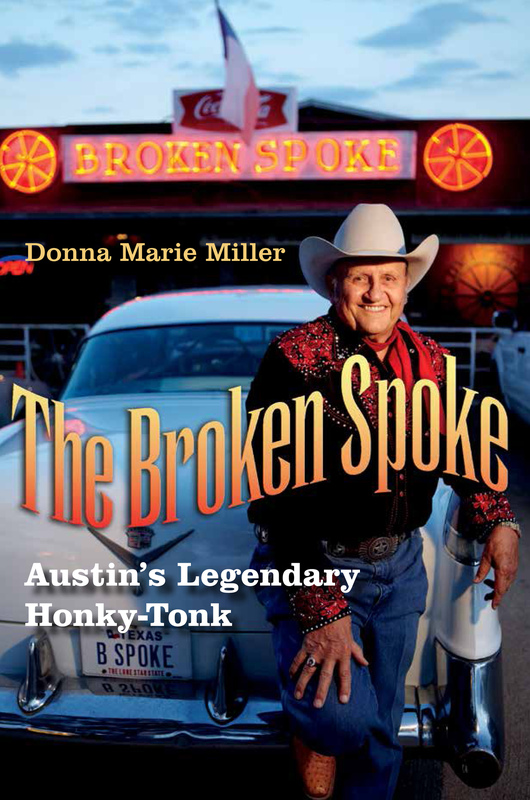 The Broken Spoke: Austin’s Legendary Honky-Tonk. By Donna Marie Miller. of the three story lines in a common historical setting. the “Spoke” plays in the local and national music community. Most importantly, The Broken Spoke is a quintessential American story. any student or enthusiast of Texas music and cultural history. James White and I spoke to members of the Barton Creek Country Sept. 20, 2018 about the Broken Spoke and signed copies of my book while Ben Stafford Rodgers performed a few classic country songs. Jenny Wren, co-producer of the 2016 documentary, Honky Tonk Heaven: The Legend of the Broken Spoke, also talked about the film and sold copies of the DVD. Marianna Dydek with Barton Creek Country Club organized our talk. James White and I talked about the Broken Spoke for members the Rotary Club of Austin Aug. 14, 2018 following their regularly scheduled luncheon at St. David’s Episcopal Church, 301 E. 8th Street in Austin. Ben Stafford Rodgers also sang a few classic country songs. Afterwards we sold and signed books.